Italian philosopher Giorgio Agamben gave a talk in Athens last November, where he discussed the supplanting of politics by security among nation-states since September 2001. Retrospectively admiring the birth of citizenship in the Greek polis, a free public space, he went on to bemoan the citizen’s descent into juridical status leaving them caught between “action and inaction, the private and the public,” unable to move and indifferent. Even when action occurs, he continued, the state of security renders actions opportunities to govern in “a profitable direction.” He argued instead not for a constituent power, but a “destituent” one that cannot be captured. We need to rediscover a form-of-life that is political. The form-of-life supposition is a central tenet in his latest book The Highest Poverty: Monastic Rules and Form-of-Life, which explicates his views on seeking a “form-of-life” that departs from the forcible prison of use and consumption. Agamben looks to monastic thinking – with a strong focus on early monastic writings in the fourth and fifth centuries, finding therein “a life that is linked so closely to its form that it proves to be inseparable from it.” Supported by such writings on the rules by which we might lead our lives, he sees that the full transformation of rule and life into a form-of-life begins among the Franciscans in the twelfth century. The main problem in addressing the relationship between rule and life, however, is the seemingly juridical quality that comes with rules. But, it is not this that is at stake in monastic thinking, claims Agamben, which seeks to instead merge action and norm. Yet while rules in this realm apply not merely to the individual, but to the collective, they nonetheless have proven foundational for the ethical-juridical rationality of modernity, and the rearticulated relationship between actions and the norms that prescribe them. While obedience to a monastery’s abbot is supported, it is also just “one virtue among others,” those others being chastity and humility. Agamben argues that the infliction of a juridical analysis upon monastic thinking was a way for the Church to control monastic communities. However, he does point to “public law” as something they must accommodate. Agamben enumerates the six passages that show a constituent process in early Christian philosopher Philo’s On Flight and Finding, wherein the monk in exile must walk through cities that are “constitutive political powers” including divine word, creation, kingdom, governance, and positive and negative legislation. Flight as such is not separated from serving the community, and instead offers the possibility to formulate new communities: “the minister of God’s holy altar is one who is in flight from his own.” It is a question of a form-of-life, an unceasing dedication to the divine order. The duties of office the monk is thereby tasked with are not about fulfilling individual initiatives, but taking form as a life, and that life is subject to common rule. Rather quickly we move from action to the book’s central motifs of poverty and use for which Agamben has now set the stage. While this content really doesn’t come into the picture until the last 30 pages, the project is clear. Reading through the Franciscan Bonagratia, who was imprisoned for heresy, Agamben notes that for monastics, property rights were not needed for use of things. The right was instead to have no rights. There are exceptions, however, wherein the monk is subject to law. Writes Agamben, “In the normal state, in which positive law applies to human beings, they have no right, but only a license to use. … In the state of extreme necessity, they recover a relationship with the law (natural, not positive).” It is this moment, the moment of necessity, where the Franciscan tradition kisses law. He returns to Bonagratia, in articulating how common use predated divisions among property and its users, which was a result of human law. 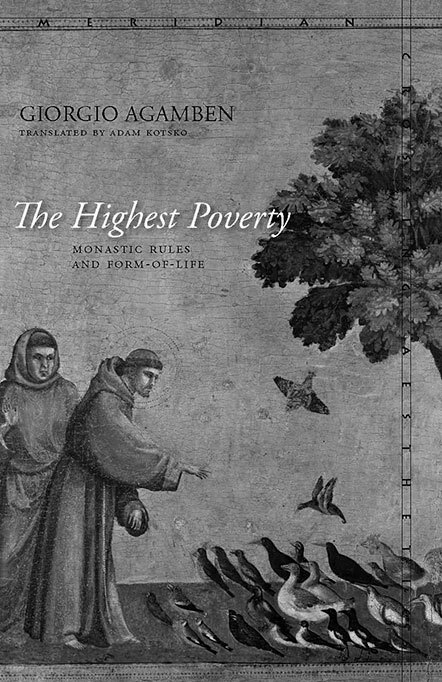 For the Franciscans, “Form of life is the purely existential reality that must be liberated from the signature of law and office or duty.” The lead-up to poverty in the text is drawn out given poverty in this case, with its focus on use without right to things, effectively works against law. The endpoint of Agamben’s research, or how to actualize it, is anything but clear. The promise, however, could be said to be in our capacity to remember that it is still possible to live a rule without losing one’s freedom, and without adopting a system we can’t abide. N.B. Please join Casco and the Van Abbemuseum for a reading group on Giorgio Agamben’s The Highest Poverty: Monastic Rules and Form-of-Life , 29–30 March 2014, featuring artist Christian Nyampeta and scholars Krijn Pansters and Adrian Rifkin. Participation is free. For more information visit: www.cascoprojects.org and to reserve your place contact suzanne@cascoprojects.org. Janine Armin is a freelance writer and editor based in Amsterdam. Her writing on art, literature and music appears in various publications, and is forthcoming in Thought (Archive Books, 2014) and Social Life of the Record (castillo / corrales, 2014). She is editor for Casco – Office for Art, Design and Theory and book review editor for Open!.